Back in August(yes, that long ago. I am a bit ashamed I have delayed this so long) I received another book from FSB. I was excited to read it, but school was starting then and I thought things would slow down as we established a routine and I’d be able to pick it up and read it. From August until about two weeks ago I’d only made it to chapter 4. What I had read was good so far, but I just couldn’t find the time to devote to it. It also seemed like a book where you had to pay attention or you might become lost. I didn’t have that much attention left at the end of the day. I sat it on the AH’s bedside table and asked him if he wanted to read it, that it seemed like something he would enjoy. It took him about a week to read and he did enjoy it. The following is his review of the book. Wow! I hate to admit that this book sit on my desk for an unusual length of time before I was able to pick it up. I typically have not been that interested in Asian history or the origins of Buddhism This book changed all of that. This book is literally riveting and very difficult to put down. I had no idea this little gem was sitting there waiting on me, if I had known what wonderful things it held I would have rearranged my reading list and started reading it the first day it arrived in the mail. This book is, at it’s most fundamental level a biography of a rather amazing individual named Marc Aurel Stein (November 26,1862 – October 26,1943). How it is that I’ve never heard of this individual before reading this book is a little bit depressing honestly. Aurel Stein was a rather extraordinary man who spent decades exploring some of the most inhospitable and treacherous areas on the planet. Aurel Stein was the Sir Edmund Hillary of the desert. 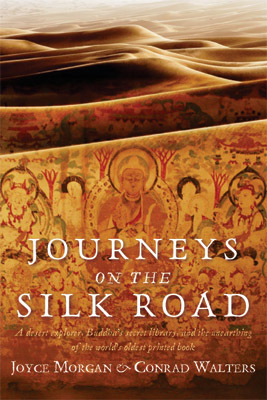 Journeys on the Silk Road is one of the more well written biographical accounts I’ve had the pleasure of reading. It’s evident that the authors have done their homework and then some. This book was a pleasure to read, it was well thought out and the editing superb. In the process of writing this book, the authors seemed to wisely not only focus on Stein himself, but on what motivated him to accomplish the unimaginable task before him. After reading this book I have a feeling that I know the subject of the biography. As a result, I’ve also developed a greater interest in understanding Buddhism at a deeper level. The authors were careful to document, not only Stein, but many of those people who helped him accomplish his journey and accomplish it very well, including a series of dogs (Dash I – Dash V). The authors seem to realize that even though this book is a treasure trove of wonderful information, the interesting things to be known concerning Aurel Stein’s journey on the silk road can’t possibly fit into any reasonably sized book and they have gone a step further and provided a good deal of reference information, some of which I have followed in order to learn even more. The information and detail are such that I believe this book would and could make a wonderful stand-alone course on Aurel Stein, and, or the foundations of Buddhism, and it would definitely add something to even a course in the history of printing. This book was a pleasure to read and I feel that I’ve been enriched for reading it, and I think you will too.. If you wish to learn more about this book please visit the website at Journeys on the Silk Road. Disclaimer-I received this book free from FSB Associates. All that was required of me was to write a positive or negative book review on my site. This entry was posted in Reading and tagged a good read, Book Review, Conrad Walters, FSB Associates, Journey on the Silk Road, Joyce Morgan, reading. Bookmark the permalink.